This is the first game in the LEGO Batman series. For other games in the series see the LEGO Batman category. LEGO Batman: The Videogame is a 2008 action-adventure video game, created for the Xbox 360, PlayStation 2, PlayStation 3, PlayStation Portable, Nintendo DS, and Wii. 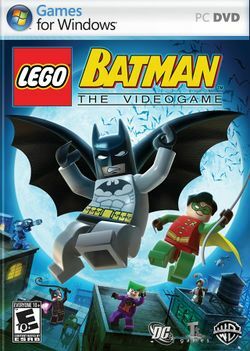 The game is based on the comic book character Batman and the LEGO Batman toy line. It was developed by Traveller's Tales and published by Warner Bros., who also handled marketing and financial aspects of the game. It was released on September 23, 2008, for the PlayStation 3, Wii, Xbox 360, PlayStation 2, Nintendo DS, PlayStation Portable, and Microsoft Windows. The game is similar to the LEGO Star Wars series and LEGO Indiana Jones: The Original Adventures, in that it is both a game based on a licensed property, and has environments, objects, and creatures made out of LEGO. The game features Batman and Robin fighting crime and villainy in Gotham City. Batman's most dangerous and murderous foes have all escaped from Arkham Asylum and divided themselves into three groups of five, each led by a "clever" and well-known villain with plans to achieve a personal goal: the Riddler, who is after the city savings in the Gotham Gold Reserves; the Penguin, who plans to seize control of Gotham using remote controlled penguin robots; and the Joker, who intends to blow up the cathedral and spread his deadly laughing gas across Gotham. Each group is accompanied by hundreds of thugs and small timers who murder and steal under their orders. Each group member also has a specific set of goons that are tailored to their crimes. The villain missions mainly show how the villains set up their plans, while the heroes show the fates and outcome of the villains and their sadistic plots. The general pattern in each story is that the leaders often leave their associates at the hands of Batman or the police once their use is over. Eventually, Batman & Robin disrupt all their plans and send all the villains back to Arkham. The Riddler is captured due to the clues he leaves behind, Penguin's robots and equipment are destroyed, and the Joker fails to detonate the bombs. The last scenes show most of the villains being oddly content to be back in Arkham, except for the Joker, the Penguin, and the Riddler, as their plans have failed. This page was last edited on 10 July 2017, at 10:42.